Stainless steel has been used as a construction material since the 1920s, so it is certainly not a new product. In fact, its rising popularity in recent years is testament to how suitable it is for use in the building industry, with uses ranging from roofing and safety railings to architectural cladding. It has also been shown, due to its use over so many years, to have a long lifespan, which is an important consideration in construction. There are many benefits to using stainless steel in architectural designs. Firstly, it is strong, meaning that it is ideal for use as structural support, even when placed under high tensile stress. It is, therefore, now a popular choice for bridges, particularly for the areas of the structure that will be exposed to potentially harsh weather and environmental conditions. The first stainless steel bridge that was designed for vehicle use was the Cala Galdana Bridge, on the Spanish island of Menorca. It is also a popular choice for pedestrian bridges around the world. London’s Millennium Bridge, the first new pedestrian bridge to be built over the River Thames in over 100 years, is partially constructed from stainless steel. It was also the material of choice for the renovated underpass in Sartrouville, near Paris, France, which was completed in 2011. Being underneath the railway lines, it needed to be sufficiently strong to prevent collapse under the weight of the trains. Both the cladding panels and the rectangular support beams are constructed from stainless steel. In addition to its high strength, stainless steel is also highly resistant to corrosion. This means that the structures are low maintenance, and unlikely to be damaged by exposure to rain or salt. This is especially important in coastal regions, where iron or steel that is not stainless is prone to rusting. The use of stainless steel instead removes the need for regular painting to protect the metal. The Helix Bridge in Singapore, which would be heavily exposed to salt water from the sea, is stainless steel in order to resist corrosion. Exhaust gases can also contain corrosive chemicals, especially when they combine with water vapour in the air. This was also one of the reasons for choosing stainless steel in the Sartrouville underpass. There are many different types of stainless steel. Adding small quantities of a metal called molybdenum increases the resistance of the steel to corrosion, particularly to chlorides (usually in the form of sodium chloride, from salt water). This is beneficial in coastal areas and in large cities. It has been used for the exterior cladding of One Canary Wharf, London, most likely due to its corrosion-resistant properties. Another advantage of stainless steel is its versatility. It can be made into almost any shape, giving it an exceptionally wide range of uses within the building and construction industry. It is not simply restricted to structural supports or flat sheets of exterior cladding, but can be used to create more unusual shapes instead. The architect Zaha Hadid made use of this feature in numerous designs, such as the University of Oxford’s Investcorp Building, which has fluid curves that have been used to connect two existing Victorian buildings. Frank Gehry also used this to his advantage when designing the Walt Disney Concert Hall in Los Angeles. Stainless steel’s ability to resist corrosion from air pollution was also undoubtedly a consideration here. 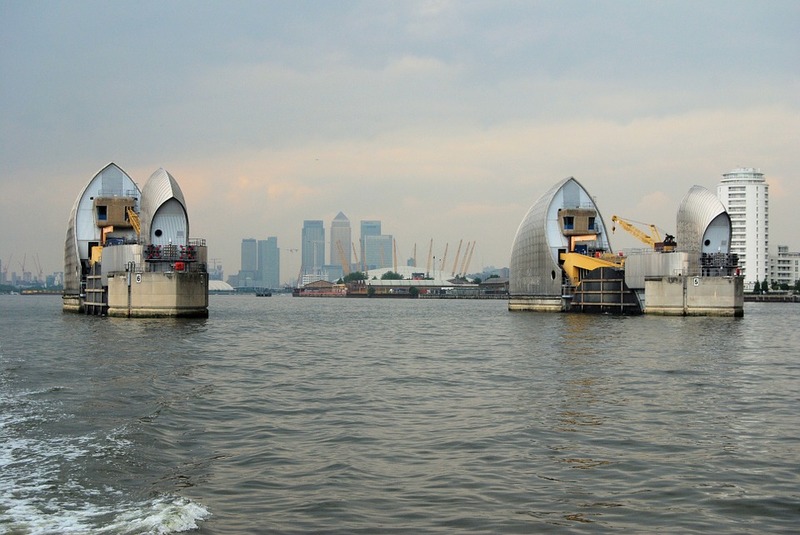 Making use of all of these advantages possessed by stainless steel is the Thames Barrier. Spanning the 520m width of the River Thames, the ten stainless steel piers make up one of the city’s most distinctive landmarks. High strength combined with a low need for maintenance is essential here, as its purpose is to prevent flooding in the city. It is constantly exposed to both air pollution and water, yet the stainless steel making up the structure has prevented any damage from occurring.